I'm a kway, you're a kway. (Occupy Tiong Bahru: February 18, 2012) The small front room constantly played Hong Kong martial arts movies dubbed in Mandarin. This was a piece entitled Mother Tongue, by Green Zeng. In the room next to that was the Belly of the Beast, by Mark Wong, whose piece featured a small black teddy bear playing a deathmetal sound artwork with a deep voice growling the "...for richer and for poorer, in sickness and in health' lines read at weddings. The growling was accompanied by the sound of a pounding heart, droning guitar and an occasional scream. I was in the kitchen, serving kway. It was great to interact with so many people. I gave out 200 pieces of way. My project was simple , a collaboration with Kim Lam Hong Confectionary, a family that has been making kways for at least three generations. 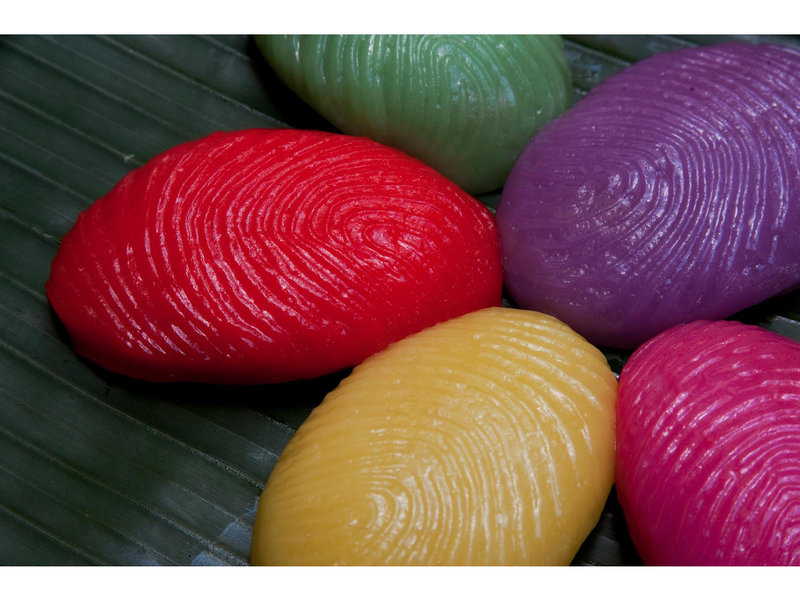 By next week we will created a kway with a design based on my thumb.The thumb kway will be an edible sculpture. It may also symbolize individuality, cultural identity and gentrification.And yes, there are prints for sale. There is more information here: https://sites.google.com/site/artbooksandkway/press-materials-and-background-info-for-kwaytology What follows are the notes which I did not refer to/read from..Please note that these are my personal notes, a kind of rough draft , and that I have not credited the sources. THESE ARE NOTES, NOT A FINISHED SPEECH/TEXT//a work in progress.... NOTES FOR PROJECT IAKYAK @ Occupy Tiong Bahru I’m A Kway, You’re A Kway Five parts: self –introduction, history of kways, description of this project, conclusion, eating... Jokes....(...are there any jokes about kway?) What is small, red and whispers? ... A HOARSE RADISH..." "What do you get if you pour boiling water down a rabbit hole? Hot cross bunny." "Why did the tomato blush? Because it saw the salad dressing." "How do you make an apple turnover? Push it down a hill." "Two peanuts walk into a really rough bar. Unfortunately, one was a salted." "Waiter, waiter, what's this fly doing in my soup? I think it's the backstroke, sir." SELF INTRODUCTION American from Ohio, artist, writer, photographer, video maker http://www.scribd.com/doc/79168211/Stephen-Black-2012-resume In Asia for a long time, Singapore since 2002. mention Book Merah,Tiong Bahru book and Its May publicationhttp://www.facebook.com/groups/148936017061/http://www.facebook.com/groups/150392581680539/# https://sites.google.com/site/artbooksandkway/ KWAY HISTORY( from Wikipedia) Kuih (also kueh, kue, or kway; from Hokkien: 粿 koé) are bite-sized snack or dessert foods found in the Malay Archipelago as well as the Southern China provinces of Fujian and Canton. Kuih is a fairly broad term which may include items that would be called cakes, cookies,dumplings, pudding, biscuit, or pastries in English and are usually made from rice or glutinous rice. Chinese kuih, written as "guo" (粿) or sometimes as "gao" (糕), are usually made from ground rice flours. Many of the kuihs are made especially for important festivities such as the Qingming Festival or Chinese New Year, however many others are consumed as main meals or snack on a daily basis. Example of these kuih include: Red tortoise cake (Chinese: 紅龜粿; Pe̍h-ōe-jī: Âng-Ku-Kóe) is a small round or oval shaped Chinese pastry with soft sticky glutinous rice flour skin wrapped around a sweet filling in the centre. It is molded to resemble a tortoise shell and is presented resting on a square piece of banana leaf. As suggested by its name, red tortoise cakes are traditionally red in color and has a sticky chewy texture when eaten. Red tortoise cakes are shaped like tortoise shells because the Chinese traditionally believed that eating tortoises would bring longevity to those who are eating it and bring about good fortune and prosperity. Considered to be auspicious items, these sweet pastries are especially prepared during important festivals such as Chinese New Year as offerings to the Chinese deities. Red tortoise cakes are also prepared for occasions that are culturally important to the Chinese such as a newborn baby's first month or birthdays of the elderly. Eating red tortoise cakes during these times are meant to represent blessings for the child and longevity for the elderly.In modern times, red tortoise cakes continue to be important food items during Chinese festivals in many countries such as Singapore, Malaysia, China and Taiwan. However, eating red tortoise cakes in these countries is no longer restricted to special occasions for red tortoise cakes are also commercially available in many pastry shops and bakeries. There are two main components in red tortoise cakes, the skin and the filling. The skin is made mostly from glutinous rice flour and sweet potato whereas the fillings are made from precooked ingredients such as mung bean or grounded peanuts and sugar. After kneading and molding the ingredients together, the red tortoise cakes are steamed on a piece of banana leaf. In countries such as Singapore, these pastries are popular snack items and are especially popular with children because of their sweet and savory taste. In fact, many bakeries in Singapore have created red tortoise cakes in a variety of assorted flavors, including jelly and red bean, to cater to all tastes and preferences n Chinese culture, the color red is traditionally used as a symbol of joy and happiness whereas the tortoise symbolizes longevity, power and tenacity. As such, red tortoise cakes are of a high cultural significance and value amongst the Chinese people. They are typically associated with auspicious occasions and are especially prepared during birthdays and religious festivals to symbolize blessings and good fortune. Lunar New Year Chinese New Year is the most important festival in Chinese culture as it represents the start of a new year for everyone where people could reconcile and welcome the new year in hope for peace and prosperity. During this festival, the Chinese people would pray for good fortune and sweets such as rice cakes and red tortoise cakes are offered to the Chinese deities on ritual altars. These ritual offerings are made in the hope that the sweetness from these cakes will leave a sweet taste in the mouths of the deities and they will bless the people with a prosperous year ahead. Jade Emperor's Birthday The Jade Emperor is one of the most important gods in chinese folklore. He is believed to be the ruler of heaven and his birthday falls on the ninth day of the first lunar month. To celebrate his birthday, the Chinese people will conduct prayers in his name and prepare food within Chinese temples or Chinese households as ritual offerings. In Chinese culture, red tortoise cakes are considered must-haves amongst the food items that are to be offered to the Jade Emperor on altar tables. Because the number 6 is considered an auspicious number in Chinese culture, red tortoise cakes are placed on the altar table in multiples of six such as 12, 24 or 36 in the hope that he will bless the people with good fortune and prosperity. PROJECT DESCRIPTION ABOUT THE TITLE I’m OK, You’re OK Seventies best 15 million copies Dr. Thomas Harris Perhaps mention the history of OK, the word itself...O Kway!I'm Ok, You're OK... a Seventies reference/..Another Seventires reference, Planet of the Apes.Ape shall not kill ape. Kway shall not kill kway INSPIRATION 1.Joseph Beuys and other artists who work with the community to create projects. I think the tree is an element of regeneration which in itself is a concept of time. The oak is especially so because it is a slowly growing tree with a kind of really solid heartwood. It has always been a form of sculpture, a symbol for this planet.3 The planting of seven thousand oak trees is thus only a symbolic beginning. And such a symbolic beginning requires a marker, in this instance a basalt column. The intention of such a tree-planting event is to point up the transformation of all of life, of society, and of the whole ecological system...4 From the 7000 Oaks Project 2. Ferran Adria/ El Bulli and Documenta 12 The mystery of Ferran Adrià's role in Documenta 12 has finally been solved. As La Vanguardia reports, the star chef will participate from afar, by keeping a table for two open to exhibition visitors at his restaurant El Bulli on the Costa Brava, outside Barcelona, every night of the show. The lucky two will be chosen randomly by Buergel in Kassel and offered airfare, along with a meal at El Bulli. The award-winning restaurant, which is fully booked for the next year, will officially become an auxillary site of D12—known as "the G pavilion"—during the hundred-day event in Kassel. "Instead of us coming and cooking here (in Kassel), which was impossible," Adrià told reporters, "we transferred Documenta to Cala Montjoi"—nearly a thousand miles away from Kassel. "Cooking cannot be 'musefied'—it is an artistic discipline that needs its own scene," explained Adrià, who admits that some might be disappointed by his no-show in Kassel. "In the end, the visitor decides what is art and what is not." GOALS At first , the following ideas were considered: A new food based on the traditional foods of Tiong Bahru. Work with traditional food makers and the new chefs in the neighborhood- perhaps a simple molecular version of a traditional dish Sustainability, local produce. Challenges: worst time of year- Christmas and CNY KWAY moves to the forefront because the other ideas are too logistically complex. Louis and Lim Lam Hong in my neighborhood, friendly and openminded second/third generation http://146angkukueh.blogspot.com/ New flavors and new designs CNY is/was a challenge. CNY is/was a challenge. CNY is/was a challenge. CNY is/was a challenge. CNY is/was a challenge. CNY is/was a challenge!!!! Design, however, moves forward as this I can do this by myself. Tuesday new design will be ready Premier next week Ongoing project THUMBPRINT symbol of individuality , yet anonymous Hong Guan Tan worked on the design as well as the red dot poster The business man Mr. Hirst. The world’s biggest show. http://www.thedailybeast.com/newsweek/2012/01/15/damien-hirst-s-spot-paintings-take-over-the-world.html To take in the whole work I’d need to hike to the dealer’s two other venues in Manhattan, and then fly to Gagosian branches in Los Angeles, London, Paris, Geneva, Rome, Athens, and Hong Kong. Hirst, the British art star who turns 47 this year, has spread 331 of his signature dotted canvases, out of some 1,400 he made, across Gagosian spaces around the world. By appropriating Hirst's commercial designs, kway is decontextualized from tradition and becomes associated with a sophisticated successful art practice, ie "edgy." CONCLUSION So.. I’m A Kway, You’re a Kway Ultimately, this project is about identity, especially the issues of self-identity and community identity. Kways can function as signifiers of this neighborhood’s identity; kway is, perhaps, a symbol of what makes Tiong Bahru Tiong Bahru. This statement acknowledges the fact that food, especially the market, gives Tiong Bahru its character. Architecture also does this, of course, but because of conservation policies, the physical structures of Tiong Bahru are unlikely to change. Kway shares the following characteristics with many of the foods which are associated with Tiong Bahru: - Kways are created by second or third generation food makers. These people have experience. Loyalty to, or at least a strong personal interest in, the food. -Kway makers and traditional food makers are a part of the neighborhood. - Kways are inexpensive.... rents increase. Kways and other inexpensive foods not only are a value to everyone, they play a large role in the lives of those with small fixed budgets and/or low income. To summarize, kway symbolizes the social and cultural environment of Tiong Bahru. When the price of doing business increases and the traditional customer base decreases, the kway makers are at risk. If a kwaymaker's children decide not to continue, this means labor must be hired-yet another cost. If handmade kway in Tiong Bahru disappears, it may indicate a future in which mass produced foods or non-traditional foods become dominant.This project is not a rant against tasteless gentrification, it is a celebration of tradition, diversity and uniqueness using the colors, textures and flavors of kway. It is my hope that by increasing the awareness of kway and what it represents that Tiong Bahru can better define its identity and those characteristics which make it such a unique place. This entry was posted in Art, Food, I Ate Tiong Bahru, Stephen Black and tagged art, food, sculpture, Singapore. Bookmark the permalink.